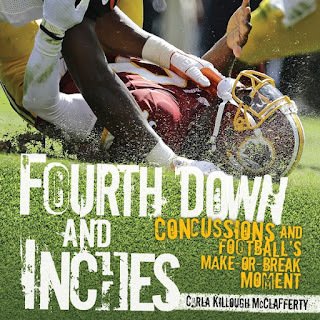 Concussions and Football’s Make-or-Break Moment. I chose this for today because it demonstrates how to blend facts with punctuation and style to make readable and exciting text. The following passage is on page 41 of the book. In this section I’m using a creative way to explain what happens on the football field when a player gets a concussion. Before the reader gets to this page, I’ve explained exactly what a concussion is. In this section I’m showing what happens in the brain when a concussion happens. The player lines up. He concentrates on his job. He anticipates his opponent’s move. His blood is pumping. The ball is snapped. Instinct and memory of countless hours on the practice field take over. Like instruments in an orchestra blending together to play a symphony, every part of the player’s body is working in perfect harmony. In the player’s brain, one hundred billion neurons are sending and receiving messages at lightning speed to make it all happen. Heart beat. Lungs breathe. Pick up your feet. Move your arm. Look at the coach. Remember the play. The neurons transmit these messages through a long fiber, called an axon, that is attached to each neuron. This information moves down the axon through an orderly chemical process. When the message gets to the end of the axon, a neurotransmitter transmits the message to the next cell. And so on. And so on. Then BAM! An outside force causes the player’s brain to crash into the side of the skull. Then it bounces off and crashes into the other side of the skull. The brain, which had been busily transmitting countless messages immediately reacts to this crisis. A chain reaction begins as chemicals in the brain move around in chaos. Message-carrying neurotransmitters are interrupted before they reach the axon. Suddenly, the brain can’t send or receive messages normally. 1. I wanted to grab the attention of the reader by putting them vicariously on the football field. 2. I wanted to show the physical and mental aspects of playing football. 3. I wanted to inform readers about the one hundred billion neurons and axons in their brains and how they transmit information. 4. I wanted to inform readers that a concussion disrupts those messages. 5. I used a lot of short choppy sentences to indicate fast moving information. 6. I used some sentence fragments to indicate many things happening simultaneously in a football players body. 7. I used “Then BAM!” because I wanted to reader to make the jump between a brain working normally, then BAM, a concussion happens and the brain does not work normally. Since we are looking at punctuation and style today, let’s see which of two paragraphs below is the most interesting. When a football player reacts to the beginning of a play, neurons move fast through their brains to control their body. Countless neurons and axons transmit messages through their brains. Which paragraph do you prefer? P.S. from Carmela: Don't forget: Today's the last day to enter for a chance to win editor Cheryl Klein's The Magic Words: Writing Great Books for Children and Young Adults (Norton)! Definitely prefer the paragraph you chose, Carla. I love how you used BAM! so effectively. Thanks for this peek into your process.